Gah, damn you Ruins for taking up so many of the last few hours of today, you almost made me miss my self-imposed schedule of posting about something horror every day (the Star Wars Death Troopers thing doesn’t count). Okay, so as I mentioned a few weeks ago, I scored three Critters VHS tapes at a flea market. I’m pretty sure I’ve never seen Critters, even as a kid, but I remember being amazed by the box art of the tape at the video store. Anyway, the box art is much cooler than the movie. I guess it’s aimed at a younger audience and I’m not young anymore, so it didn’t really keep my attention. See, the plot of the movie is that these aliens called Krites escape a space prison (maybe it’s the same one from Star Slammer. They land on Earth and then these shapeshifting bounty hunters follow to take them back. It takes a little while to get going and then it’s not all that thrilling, like I said, aimed at kids and featuring a proto-Forrest Gump who swears he knew the aliens were coming. I hear he’s the star of the next few movies. It wasn’t a great movie, but it was good enough for me to at least want to watch the next three movies in the series, though I can’t promise I’ll still be saying that after another movie or two. One thing I did want to mention is that I was surprised at how good the movie looks. They don’t cheap-out on the space prison or the space ship. I mean, they’re not mind-blowing, but they’re pretty good. Then the actual Krites look cool. I mean, they’re Tribbles with mouths, but they’re still pretty scary Tribbles with mouths. The gore was light, which again is understandable because this is like a kid’s movie. Gremlins super-light basically. 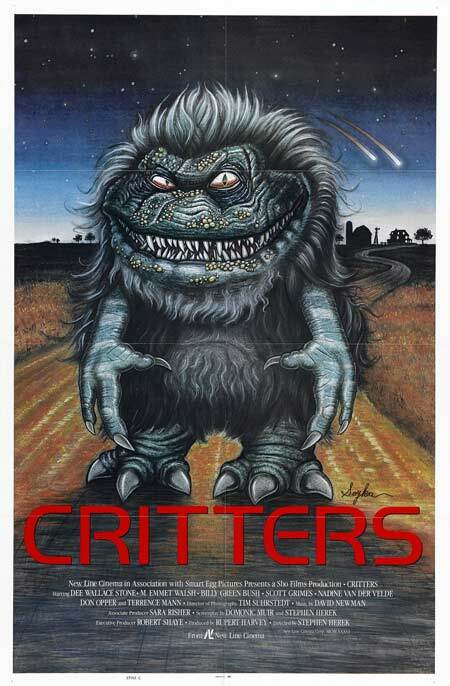 I think I would ad Critters 1 and 2 movie posters to my man cave in a heartbeat. Also, this was definitely not my mystery Mini Monster movie. Damn, gotta keep looking.